A Verification of Assets Report from Finicity is just one piece of speeding up the lending process. You can find exactly the information you need to verify your borrower’s assets and move ahead with the rest of the loan origination process. Here are the highlights of our Verification of Assets Report. Hover over the highlighted sections for more information. This is the ID that will be used to both request copies of this report and is the “Re-Issue ID” that would be passed on to the GSE, i.e. Fannie Mae, Freddie Mac. This is the ID used for Day 1 Certainty. Find your borrower’s information, along with time period, type of report and the requester (you). This is the sum of the current balances in all accounts included in the report. This is the average balance for the past 2 months, based on the daily balances of all accounts. If less than 2 months of transactions are included in the report, this field will be blank. This is the average balance for the past 6 months, based on the daily balances of all accounts. If less than 6 months of transactions are included in the report, this field will be blank. 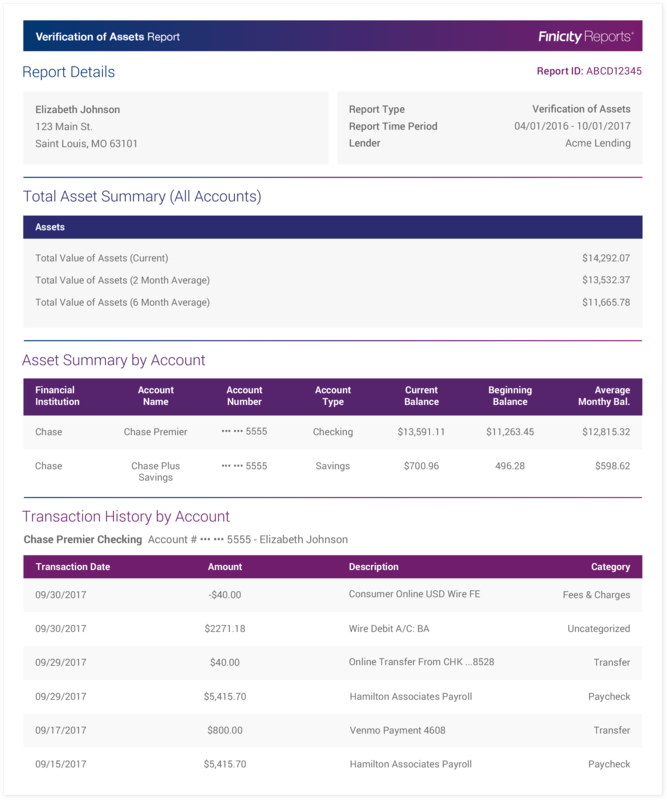 Each account included in the report is shown here, with the beginning, current, and average balance of each account. For each account, up to 6 months of transactions are shown if available from the financial institution. This includes transactions such as deposits, withdrawals, transfers, etc. The name(s) of the account owner displayed here is the name of the account owner(s) on file with the Financial Institution.